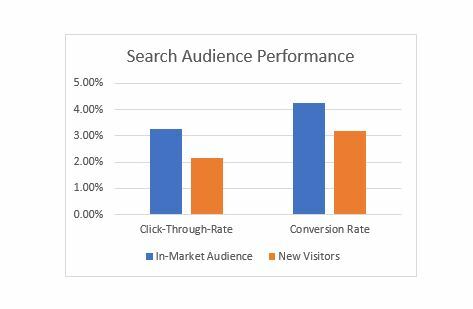 While the concept of RLSA campaigns (Remarketing Lists for Search Audiences), Customer Match, and Similar Audiences have been key SEM strategies for some time now, Google has recently introduced the ability to use existing in-market audiences for search. These audiences were traditionally only available for GDN campaigns. This gives paid search marketers the opportunity to further test and optimize search campaigns using audience strategies and boost keyword performance in a cost-effective manner. An in-market audience is designed to connect your campaigns to individuals who are actively searching on terms heavily related to your industry. Google analyzes millions of users, looking at search history and site behavior. They even consider previous conversions, looking at what the users have (and haven’t) purchased. Ideally, these individuals are closer to making a purchase, and are past the research stage. These users are divided into audiences that can later be applied to your campaigns. For example, consider the scenario below. Based on his search history, Joe would be a prime candidate for the travel audience. When you couple intent with the current keyword set, you can hone in on the right audience (see details below). The categories of in-market audiences range from things like software and financial services to dating sites and babies. Once you select a major theme, you have an option to narrow down your selection even more. Below depicts the multiple selections users can choose under the Travel theme. In-Market audiences are not new. Google announced this targeting option in 2014. Yet, the ability to use them within search was announced back in May 2018. Our agency has tested using in-market audiences for display campaigns in observation mode, and consistently saw poor results. Consider our findings below. The answer is always! For search campaigns, you should always be using in-market audiences, or any audience for that matter. Just because you apply an audience to a campaign, does not mean that you need to increase bids on these audiences. For search campaigns, you can overlay audiences, in observation mode, and then analyze performance of these audience segments. This is a great way to test out if in-market audiences, and which in-market audiences, work best for your campaign. At first glance, it may seem that in-market audiences are only beneficial for eCommerce, consumer-based businesses, but that is not true. In-Market audiences provide a great opportunity for B2B business to exclude irrelevant searchers. Applying an in-market audience as a negative to a campaign can help to create a more targeted audience, boost conversion rate, and most importantly save money. Software based companies may find that their conversion rate is weaker for specific audiences bucketed into the travel and lifestyle related audiences like beauty, apparel and hotels. That being said, negative audiences are not limited to B2B companies. For example, it is pretty safe to assume that a wedding venue is not interested in targeting users whose search history has been focused on dating sites. Again, these assumptions can all be confirmed through testing. Before you make any bid adjustments or create targeted campaigns using these audiences, it is crucial that you overlay all relevant audience types to your campaigns and analyze the results. The audiences will gather data over time, and then you can factor in conversion rate and click-through-rate numbers to help aid your decisions. You may be surprised with the results, which is why we always recommend testing as many audiences as possible. There are obvious assumptions. For example, it is likely that a rental car service, would benefit from targeting users who have previously been interested in booking a hotel. However you may find that users who have a previous interest in beauty and travel convert better for your luxury watch website. As Google announces more and more new features, we can see a common theme evolving. Google is moving toward “machine learning” which ultimately is causing marketers to steer away from the strong reliance on the keyword, and shift gears to focus on utilizing on this user intent data provided from Google. We can expect more and more announcements based on “automated learning” to come from Google. We are keeping up with the trends and determining what works and does not work with these new features. Strategic targeting in a campaign can have many impactful benefits: increased site traffic, increased conversion rates, improved efficiency and higher return on investment. Monitoring bidding and conversion volume can only go so far to improve efficiency. Below we will discuss three targeting techniques and how they can play an integral role in increasing your return on investment. The purpose of a dayparting analysis is not to see when the most conversions come in, but instead when your business is running at its highest and lowest efficiency. With this analysis, you can then implement ad scheduling. The goal of implementing bid multipliers (by day of week or time of day) is to increase the efficiency of your paid search program which will inherently increase return on investment. Keep in mind the difference between Google Analytics and Google ads regarding how conversions are tracked: Google Ads associates the conversion to the click that led to that conversion, whereas Google Analytics records the conversion when the conversion occurs. This is an important dynamic to keep in mind when determining which data set to analyze. The example below was a dayparting analysis for time of day that was conducted for one of our clients. Time of day analyses can be done by grouping hours of the day together to get time periods (e.g. morning, afternoon, etc.) rather than breaking the day out by 24 hours, where hour-to-hour fluctuations tend to be relatively random in nature. From this analysis, we were able to determine that mornings generated leads 17% more efficiently than the rest of the day. Late evenings generated leads 48% less efficiently than the rest of the day. With these insights we were able to implement bid multipliers to take advantage of the morning efficiency and improve the current inefficiency during the late evenings. Location targeting is extremely effective at not only targeting your ideal audience, but also excluding locations outside of your target audience. People have different behaviors and tendencies depending on where they are located, which is why understanding the intricacies of this targeting type can be crucial when narrowing your audience. One of our clients in the travel space is the leading seller of attraction packages. Because their products are specific to certain locations around the world, location targeting proved to be pivotal to not only decrease inefficient spend, but to learn more about the tendencies of consumers interacting with their brand. For this client, we set up location targeting as “in-market” and “out-of-market” campaigns. The in-market campaigns target a radius around the city while the out-of-market campaigns targeted the rest of the country. Through this type of targeting, we were able to determine that out-of-market consumers (mostly tourists) converted more efficiently and at a higher rate than in-market consumers (a mixture of tourists and locals). People who are already in the desired location are less likely to purchase a multi-day attraction pass. Due to this type of targeting, we were able to shift budget and focus on out-of-market campaigns and keep efficiency high. Another client of ours was able to dramatically increase efficiency through advanced targeting. They were aware of another company with an extremely similar brand name, off by just one letter. We were able to determine where the other company had sales offices and conduct an analysis of the traffic from those cities in our own account. The results showed a vast opportunity: the cities with sales offices had traffic spikes with extremely inefficient performance. Consumers were typing in the wrong company name and clicking on our PPC ads, driving cost up while not converting. Through advanced targeting, we were able to exclude these cities which brought our cost down and increase efficiency as well as ROI. Below are examples of radius targeting surrounding a city as well as exclusion targeting to block traffic from multiple cities. Demographic targeting allows you to pursue consumers based on age, gender, household income, and more. Google gathers information to make demographic targeting possible in a few different ways: the settings in a consumer’s personal google account, 3rd party sites such as social networking, and browser cookies dropped by Google during a consumer’s web navigation. Due to the nature of this data, demographic targeting may not be 100% representative of your actual audience but is a great way to learn more about who is interacting with your brand. To properly utilize demographic targeting, it is best to set up an observational audience in Google Ads to get a sense of who is clicking on your ads and converting (or who is clicking on your ads and not converting). Depending on the size of your business, it is best to let this audience observe users anywhere from a few months to a few years in order to gather adequate and statistically significant information. It is imperative that you generate enough data and that your results are statistically significant to ensure you make the right account optimizations that are data driven. This data can either guide your demographic targeting or uncover expansion opportunities for your business. For example, you may think that your product is meant for 20- to 30-year-olds and position it as such, but the observational audience may tell you that many people 60+ are purchasing your product as well. With this data you could then create a new campaign with adjusted messaging targeting that 60+ audience through Google Ads demographic targeting. You may also add positive or negative bid multipliers to increase or decrease visibility of your ads to certain demographics. These three targeting techniques have the potential to significantly increase ROI. This is done through narrowing in on your target audience, trimming unnecessary and excessive spend, and using the information already available to make better decisions. If you are interested in learning more about optimizing your PPC program, please contact us by email at sales@synapsesem.com or by phone at 781-591-0752. Today, consumers are putting mobile first. Increasingly (and habitually), more of us are turning to our smartphones during moments of need – to ask a question, find a solution, reach a local business, and even to book travel or search for a new home. According to Google, 96 percent of smartphone owners today use their mobile device to get things done, with the average American spending 3-plus hours a day on their smartphone. As we move further into 2019, these numbers are only expected to climb. Fact of the matter is, people prefer mobile. It’s fast, efficient, and always at our fingertips. Google sees this, and is taking major steps to serve users a better mobile experience. The search engine giant, which now receives the majority of its search traffic from mobile devices, is putting mobile-first. You may have heard of Google’s mobile-first index, which began rolling out in March 2018. Since then, about 50 percent of websites have been switched over to Google’s new mobile-first index, leaving half of websites to go. Which half are you in? If you have questions regarding mobile-first indexing – what it is, how it might affect your online presence, whether your site has been switched – you are in the right place. Below we answer common questions regarding mobile-first indexing. Mobile-first indexing means that Google will predominantly use the mobile version of a website for indexing and ranking. The search engine spiders will first crawl a company’s mobile content – to determine how relevant a webpage is and how it should rank in the search results – before analyzing the desktop version. A website’s organic rankings, both desktop and mobile, will be informed by this mobile crawl. Simply put, it means that the mobile version of your website is now the most important one. Historically, Google evaluated and ranked web content based on its desktop version. Their index solely contained the desktop iteration of websites, serving any alternate, mobile versions for smartphone and tablet users. Now that most users conduct searches on mobile, the dynamic has changed. Google will primarily base a website’s rankings on its mobile content. If you do not have a mobile (or mobile responsive) website, however, Google will continue to index your desktop content. Have You Been Switched to Mobile-First? If you are unsure whether your website has migrated to mobile-first indexing, check your Google Search Console property. Google is notifying webmasters via a Search Console message. You may also notice a significantly increased crawl rate from Smartphone Googlebot in there, as well, which is an indicator of mobile-first. If you do not have a Search Console account, well, set one up! You can also manually check out Google’s Search Results and cached pages to see if your mobile site ranks. Most websites included in the first wave do not need to stress over this change, however, as they have been deemed ready for mobile-first indexing. Many of Synapse’s clients who have been migrated, for example, have a mobile-responsive website in which the desktop and mobile content are exactly the same, with the same HTML code. With a responsive site, there are typically no separate versions – instead, the site responds to screen size. More on this in a minute. If your website was not included in the initial roll-out of mobile-first, do not panic. Google explains sites that have been migrated do not have a “ranking advantage” over mobile content that’s not yet gathered in the mobile-first index. This also doesn’t mean that your website is not mobile-friendly. Google assures that the mobile-first index is independent from their mobile-friendly tests, and many mobile-friendly sites have yet to migrate to mobile-first. Still, site owners should continue to optimize with mobile in mind in preparation for the next wave. How Will Mobile-First Indexing Impact Your SEO? As Google notes above, the mobile-first index will not give certain websites a ranking advantage – mobile-first is just a change in the way they crawl and gather data, after all. That said, however, mobile-first indexing may reward websites that have made mobile optimization their priority. So if your website is not mobile optimized yet, you might see a negative effect as the mobile-first index rolls out. There are a few considerations to keep in mind as Google moves to mobile-first. Perhaps most importantly, consider how your website is set up today. Do you have a mobile website? Does your website use a responsive design for different devices, or do you have separate URLs for each? If you have a responsive website design, in which your mobile content is the same as your desktop content, you will likely not experience any impact when migrating to the mobile-first index. Google explains that websites using responsive design or dynamic serving are “generally set for mobile-first indexing.” However, if your website has separate mobile and desktop content, there are certain steps you should take to prepare. Does every desktop URL on your website have an equivalent, alternate URL serving mobile-optimized content – for example, www.website.com and m.website.com? With the mobile-first index, Google will no longer index www.website.com as your primary site. Instead, it will prefer the m-dot version of your webpages for ranking and indexing. Ensuring that your mobile site contains the same content as your desktop site. If your mobile site has less content than your desktop site, update it so that it is equivalent – in text, word count, images (with alt attributes), and videos in the usual crawlable and indexable formats. Putting structured data on both versions of your site. Make sure your mobile pages also have structured data (such as Schema markup) and that the URLs in the structured data are the mobile versions on mobile. If you use Data Highlighter for your structured data, regularly check the dashboard for extraction errors. Optimizing metadata on both versions of your site. Ensure that your title tags and meta descriptions are equivalent (and SEO-optimized) across both versions of your website. If you have separate m-dot URLs, also verify that both versions of your website can be easily crawled, accessed, and indexed. This involves using the correct rel=canonical and hreflang tags, using robots.txt directives appropriately, verifying both versions in Google Search Console, and ensuring that your mobile site server can handle an increased crawl rate. With mobile-first indexing being rolled out, Google recommends using responsive web design. This means that a website serves all devices with the same code, and that code adjusts for screen size. Not only are responsive websites easy to manage and maintain, they also have benefits from an indexing perspective. Responsive design helps Google’s algorithms accurately assign indexing properties to a page, rather than needing to signal crawlers to a corresponding desktop or mobile version. This setup also saves resources when Googlebot crawls your website, using one user agent versus multiple agents to retrieve the different versions. With more efficient crawling in place, more of your site’s content can be indexed and kept fresh in the index, explains Google. Now, let’s not confuse mobile responsive with mobile-friendly. While these concepts are generally similar, in the mobile-first index, they have major differences that can hurt your SEO. You see, responsive websites typically eliminate common mobile UX issues, such as zooming, squinting, and too small clickable links. Mobile-friendly websites, on the other hand, can still have some of those issues, even though the website will function fine on mobile. So if you’re using a mobile-friendly (but not responsive) design, you will still need to update your content in accordance with mobile best practices. How Can You Optimize for Mobile-First? Optimize your mobile load times. In July 2018, Google officially made mobile load times a part of their ranking algorithm, noting that slow-loading content may now perform less well for both desktop and mobile searchers. To assess your current mobile load times, you can use Google’s free Test My Site tool. Go Responsive. It’s clear that responsive design is preferred, and has an advantage, in this mobile-first era. On top of indexing benefits and ease of maintenance, responsive websites often offer better user experiences, faster load and redirection times, and less of those common mobile mistakes. Don’t ditch your desktop site. If your website is not mobile, Google will not stop crawling or indexing your desktop versions. However, you may see rankings drop as the mobile-first index rolls out (and in that case, you may just consider the move to mobile). Mobile optimization is becoming a standard in the search landscape. We see that with voice search. We see that with purchase behavior. We see that with the constant updates being made to Google’s SERPs – featured snippets, local pack listings, “interesting finds,” and more. And now, we see that with Google’s roll out of mobile-first indexing – one more step Google is taking to develop the search platform’s ease of use and overall UX. This is their goal, after all, to deliver the best possible experience for users. And if your focus is on SEO, this should be one of your main priorities, too. It’s time to put mobile first. To learn how Synapse SEM can help improve your mobile SEO strategy, you may complete our contact form or call us at 781-591-0752. Choosing the wrong SEM partner can cost you significant time, money and effort. And choosing a partner isn’t easy; even if you’ve received a referral from a friend or colleague, you’ll still be wondering whether that agency can meet the specific needs of your business. Agencies are often very good at selling their services but can come up short when it comes time to deliver those services. In addition, any agency that’s been around for a while will have some clients who are willing to be references (even if most of their clients aren’t), so reference checks generally provide little value. To simplify the process, and to help companies choose the right SEM partner, we’ve compiled a list of the most important questions and our point-of-view (POV) on each. These questions can be used in your initial discussions with SEM agencies, or as part of your RFP process. We’ve broken these questions into 5 key categories: Agency Expertise, Agency Reputation & Credibility, Current Client Mix, Agency Resources & Dynamics, and Account Management. Let’s get started! Q: Which services do you consider your core competencies? POV: If an agency tells you they have core competencies across a multitude of services, they’re likely stretching the truth. Most agencies specialize in a couple services, even if they’re a full-service agency. One firm may be excellent at SEM and SEO, but defers to partners or third parties for web development, and vice versa. If a potential partner primarily focuses on, for example, web development or PR and supplements their services with SEM and SEO, keep looking. Ideally, you’ll find an SEM agency that specialized in SEM, or only does SEM, and has relevant industry experience (see below). Q: Do you have relevant industry experience? Overall, we support looking for an agency that has relevant experience for the benefits mentioned above. This is especially important for certain industries, including B2B and B2C lead gen and retail/e-commerce. B2B and B2C lead gen businesses require experience with marketing automation and CRM systems as well as a general understanding of lead nurturing and lead scoring dynamics (see below for more info), while retail/e-commerce companies require experience with data feeds, product listing ads (PLAs) and other ad formats. That said, be sure to speak with potential partners about whether they’re managing programs for your competitors, and if so, how they handle the inherent conflict of interest. Also, it’s worth noting that looking for relevant industry experience vs. relevant product or sub-industry experience are two very different things. If you’re selling shoes, finding an agency with retail experience should suffice, and if you only look for agencies that have experience marketing shoes, you may severely limit your options. The same applies to B2B tech companies. If you are a recruiting software company, then the priority should be to find an agency with B2B software experience. Recruiting experience is valuable, but that’s much easier to teach the agency than all the unique factors surrounding a B2B software company. See below for more details. Q: Are you familiar with marketing automation systems and CRMs? POV: This specifically relates to B2B and B2C lead generation-based businesses. The industry has rapidly moved away from valuing leads and measuring efficiency based on cost-per-lead (CPL). Instead, many companies are leveraging marketing automation and CRM systems to measure the number of qualified leads (e.g. MQLs, SQOs, etc.) and the cost-per-qualified-lead. Lead nurturing and scoring are critical aspects of this approach, and your agency has to be familiar with this dynamic, especially as it relates to how they optimize the campaigns and report on performance. Also, your agency should be familiar with buy cycle strategies so that keywords, messaging and CTAs align with your internal goals. If you are a B2B or B2C lead generation client, it is critical that you choose a partner that has deep lead generation experience, even if it’s outside your specific industry. Q: Do you have agency partners, and if so, what do they specialize in? POV: As discussed above, finding an agency that specializes in SEM should be your first goal. However, if you need other services as well, you may be concerned that you’ll have to hire more agencies to fill those needs. However, most established agencies will have long-standing relationships with agencies that offer complementary services, and the agency can bring in those partners to provide you more integrated services while maintaining a single point of contact. Q: What is your expertise related to attribution? POV: Attribution is a hot topic right now, and for good reason. Understanding how customers are interacting with your site and how your marketing channels impact their purchasing behavior is critical. Your SEM partner should be familiar with various attribution models (first touch, last touch, etc.) and should even be able to help you decide which attribution model is best for your business. Keep in mind that attribution goes beyond just reporting; it influences how you optimize your campaigns and how you allocate budget across your various marketing channels. You need a partner that has leveraged different attribution models and understands the differences between them. Q: Do you have client references? POV: Be careful with this one. Any agency can scrounge up a few client references. The trick is to understand what you need from your agency relationship and ask the client reference whether they’re currently receiving that from the agency (e.g. if you’re a highly analytical company, you want to make sure the agency has strong data analysis capabilities). Even if that’s the case, keep in mind that you may not be assigned the same team as that client, so the level of service could vary. You should ask about the team separately and better understand who is working on your account (see Agency Resources section below for more insight). You should also ask the agency for a reference from a client that decided to leave the agency. This usually provides much more insight than speaking to a client they currently work with. Q: How many clients do you have currently? POV: This is absolutely something you want to know. An established agency should have at the very least 15+ active client accounts. Anything above 20 client accounts means that the agency has a stable client base. You also would prefer to be a big fish in a small pond, so if the agency has over 50 clients, it’s more likely that you will be put on a lower tier team (unless you have a larger budget than their other clients). Q: How many new clients have you partnered with over the last 12 months? POV: This is designed simply to gauge growth. 20%+ annual growth is standard for an SEM agency. Q: How many clients have you lost over the last 12 months? POV: This is designed to gauge churn. You do not want to be working with an agency that churns more than 10% of its business in a year. Q: Have you ever “fired” a client, and if so, why? POV: Most agencies have “fired” a client, and reasons for doing so can vary. That said, the goal here is to better understand their culture. Seeing how they respond to a difficult question can give you this insight. Q: How many in-house employees do you have, and where are they located? POV: Surprisingly, many agencies rely heavily on freelancers to handle client management. They do this because it helps them resource accounts more fluidly and better manage their employee costs. There’s no reason to necessarily oppose having freelancers working on your account, but you should demand some in-house resources as well. If your account is being managed completely by freelancers, it’s a strong indication that it is not a high priority account within the agency. Q: Who will be working on my account, and how much experience do they have? POV: This question is critical. You ultimately want to know what level of experience you’ll have on your account, and whether you will have channel-specific expertise assigned to your account. Most agencies assign a supervisor and then specialists to each account. If your agency manages your PPC and SEO programs, you would ideally have different specialists managing each, since few search engine marketers are operationally strong in both areas. You should ask for this information for both the inhouse and freelancer resources. Q: How much are you managing in PPC advertising costs per year? POV: This gives you great insight into how large the clients are. An established agency should be managing at least $3m in annual PPC ad spend. Anything above $3m indicates a healthy client base, and anything above $10m indicates a very diverse client base. You should also ask about their average client’s monthly budget. This will help you gauge the size of their clients and how you stack up (again, it’s preferable to be a large fish in a small pond). Q: How many hours per week will be allocated to my account? POV: Most agencies, whether they disclose it to their clients or not, assign a specific number of hours to each client account. This insight will allow you to better compare fees across agencies, and will help you determine the hourly rate that they’re charging. Today, SEM agencies’ bill rates range from $140 – $200/hour. You should also ask how those hours are broken out across resources (director time, supervisor time, specialist time, etc.). Q: How are your management fees structured? POV: For paid search advertising, most SEM firms charge based on a percent of spend with a minimum. The percentage can vary anywhere from 4%-25% depending on the monthly ad budget. Charging a percent of spend has become the industry norm, but it can be a very dangerous structure because it incentivizes the agency to spend more of your marketing budget, even if that additional spend isn’t generating incremental business value. Look for a firm that charges based on scope, so that their only incentive is to help you improve your KPIs. For SEO services, most of the fees are based on scope (since ad spend doesn’t apply here). Q: What level of communication and reporting will you provide? POV: For an agency relationship to be successful, it’s important to have strong communication and consensus on reporting. The frequency of communication and reporting can heavily influence the management fees, so just ensure you’re comparing apples to apples. We recommend having calls at least once per month for smaller accounts, but more frequently for larger accounts. Also, you should inquire about the format of their reporting. Ideally, the agency will be able to provide you with reports that focus on the KPIs that are most important to you, and data in formats that you can easily repurpose for your own internal needs. These reports should also be automated to ensure you’re not paying the firm to manually create reports (they could be spending their time on much more impactful efforts). Q: Is your pricing in line with industry benchmarks? POV: You will get an answer to this question once you receive proposals from the agencies. We highly recommend evaluating potential SEM partners much more based on their track record, proposed scope, and their team rather than their fees. Find the right partner first, and then work on negotiating the fees to an acceptable level (rather than the other way around). On the SEO front, if you see a vendor’s pricing is significantly lower than the others, see whether their scope includes content writing or any content marketing services. Content marketing is by far the most time consuming and most costly part of an SEO scope, and it absolutely should be included in the proposed scope unless you’ve specifically requested otherwise. If the scope doesn’t include content marketing (and specific details on what that scope entails), it is a strong indication that that agency may not be able to generate long-term improvements in SEO. As unbiased as we can be, pricing should be a factor, but certainly not the leading factor, when choosing an SEM partner. We understand that choosing an SEM partner can be a challenging task, especially considering the sheer number of SEM agencies and all the complexities surrounding scope, pricing and resources. We highly recommend that you use these questions and any others that are important to your business to add clarity and substance to an otherwise ambiguous and arduous process. As always, you can contact Synapse SEM with any questions related to our SEM, SEO and paid social services by calling us at 781-591-0752 or by emailing us at sales@synapsesem.com. In both March and April 2018, Google made broad updates to their core algorithm. Then, on August 1, 2018, yet another core algorithm update – the so-called “Medic” update – was rolled out. What did they all have in common? SEO pros like Glenn Gabe speculate these algo updates all revolved around content quality and relevance. Often, that’s the extent of what we know. Google does not always lend much insight into their core algorithm updates. And as a business owner, webmaster, or marketing exec, that can be a bit frustrating. You may be asking, why did I see a dip in website traffic after March 7th? Why did my rankings fall off after August 1st? What did we do wrong that may have caused this? More than likely, you didn’t do wrong at all. Google has said that with these recent changes, there is no real “fix.” Broad algorithm updates are not designed to penalize websites, but rather, to reward those that meet their standards for a high-quality website – one that’s user-friendly, in good technical health, and chock-full of unique and valuable content. Instead looking for a fix, Googlers continuously recommend that webmasters stay focused on creating high quality content over the long-term. So, the questions you should be asking are: What is high quality content? How does Google define quality in an age where millions of websites are trying to make it to the top (of the search results)? While Google doesn’t give us much visibility into their ranking algorithm, they have released their Search Quality Rater Guidelines to the public. And just recently, on July 20th, these quality guidelines were updated – shedding light into some new areas for webmasters to focus. To give you some context, the Search Quality Rater Guidelines are 180+ pages of rules that Google contractors will use to evaluate the quality of websites ranking in the search results. These guidelines do not tell us how Google’s algorithm works. And the ratings that stem from these guidelines do not have a direct impact on how a website will rank. Rather, the search quality guidelines are used to ensure Google’s algorithm is working properly, and that the best results are being delivered, with the highest quality websites ranking at the top. Still, they give us some great information. “Beneficial purpose” is a new concept in Google’s Search Quality Rater Guidelines, as well as a key contributor to content quality. In evaluating a page’s content, Google’s raters must consider whether the page has a beneficial purpose or use to being on the website. Is the content valuable to users, and what value does it offer? Was it created for the purpose of helping users, or was it created with other intent – to make money, to rank well in search engines? Is it overly commercial in nature? This is something that we, as content creators and webmasters, must think about in the months moving forward. Great quality content has purpose. As I wrote in a prior article, “Every piece of content created for your organization should have a purpose. It should have intent. It should be relevant – not only to your product or services, but also to what your customers are looking to read: What are they actively searching for? How often are they searching for it? How are they engaging with your website today? What is working with your current online strategy, and what is not?” This means doing some research before building your content plan, and understanding what your audience wants to read. More on that here. When developing your content plan, also ensure that any upcoming content is specialized and pertinent to the holistic themes of your website, so that Google consistently sees you as relevant or expert in your niche. And to truly be an expert on a topic, make sure to drop the marketing lingo. High quality content is not commercial or promotional in nature, but rather, discusses topics in a neutral way. This is an important distinction, as it’s suspected that commercial content was devalued in the most recent Google algorithm update. Google lends examples of what would make high E-A-T pages: A news article is produced with journalistic professionalism, references factually accurate content, and is published on a website with established editorial standards and robust review processes. Online legal or financial advice is yielded by trustworthy industry sources, and is maintained and updated regularly. Medical information is published and written by people or organizations with appropriate medical expertise or accreditation, such as doctors. The list goes on. There is E-A-T to be found within every industry. In assessing the Expertise, Authoritativeness, and Trustworthiness of a page or website, Google wants to understand who is responsible for it. Is the creator an expert in the space, or do they have sufficient experience with the topic? It’s important to note that formal expertise isn’t always required for a high-quality rating, especially in areas like fashion or gossip, where credentials may not necessarily exist. Google’s raters may look to see if content has biographical or contact information for its authors, or whether a website has sufficient information supporting the business and user needs. For example, e-commerce websites should have helpful customer service information to help users resolve issues. “Google wants their raters to not only look at the reputation of the website itself, but also the content creators themselves… This is one area that many sites fall down on. They might have an ‘About Us’ page, but the bios of their authors are sorely lacking. For us, this means ensuring that webpages have clear information that shows credibility and creates a strong trust factor. This may mean enhancing your authors’ biographies, creating more user-minded content about your business, or highlighting important awards or recognition that you’ve received throughout your website. When you’re creating content for your website, we recommend evaluating which websites are already ranking on page 1 in Google’s SERP. This will give you good insight into the amount of content you need to rank, as well as types of content you should be creating, on the subject. A satisfying amount of high-quality main content – In addition to ensuring sufficient content on a topic/theme, make sure the content is consistently pertinent to the holistic themes of your website. This also includes creating a descriptive or helpful title and great content that supports it (no more click-bait!). Satisfying website information and/or information about who is responsible for the website – This includes having a dedicated “About” page with organizational information (contact information, address, history, etc.). A positive website reputation for a website or a positive reputation of the creator of the content – This may involve earning links from credible, third-party websites to build your domain authority. Gone are the days of keyword-stuffing and creating content for content’s sake. Today, your web content must offer unique value to users, rather than be solely optimized for search engines. Today, it is high-quality, relevant, and valuable content that’s going to make your website great. To learn how Synapse SEM can help improve your content and search engine optimization, complete our contact form or call us at 781-591-0752. Millions of businesses around the world have relied on Google AdWords. In July, Google announced that AdWords would soon become unavailable. In its place would be a more efficient and streamlined interface with an entirely new brand, Google Ads. Here we will discuss some of the positive and negative changes in the transition to the new platform. July 24th was the day that Ads officially took over and forced users to use the new interface. There were many new changes and updates with the initial rollout as well as additional improvements since then. Some of the many changes that occurred were: the ability for new ad copy parameters and options, accelerated mobile page speeds, increased landing page parameters, and a completely new brand, look and feel of the site. When it was announced that AdWords as we knew it would eventually become obsolete, reactions weren’t positive. It was challenging to understand why Google was changing a platform that clients were used to and comfortable with. There are some things that are better in the new interface, but this list is far smaller than the list of negatives. In the new interface, there is an overview tab that has many visual charts to represent your account data. You can easily see things like trends in conversions, where spend has increased or dropped off, and how you compare to your competitors, among many other things. These charts are very helpful for just a quick overview of how the account is performing. Besides the overview tab, the entire layout of Google Ads is more visually appealing and user-focused than AdWords. While it took time to get used to, the various components of the platform seem to fit well in their new location and logically make sense, but just because it looks better, does not mean that the changes were necessarily positive. Although there are some beneficial components of the new interface, here are 4 places in which it falls short in comparison to its predecessor. The Search Query Report (SQR) is much harder to navigate. The SQR is found in the keywords tab. Ideally, the filters applied to the keywords would then apply to the search queries when you switch to that subtab, but this is not the way it works. You must reset filters once looking at search queries. If you click on a specific keyword and then go to the search queries, this seems to keep the filters in place, but this doesn’t always work. The new interface was designed, in part, to save the user time, but this ads time and effort to what use to be a simple report to pull. Moving quickly between keywords, campaigns, and ad groups is not as easy as it used to be. You can no longer select more than one campaign and see all the ad groups for those various campaigns without adding a filter in the ad group tab. This takes more time and is less efficient. At each level you must apply a new filter unless you click into a single ad group or campaign. Filters don’t go away unless you delete them. No matter how far you navigate off the filtered screen or what you do outside of Google Ads, no length of time will remove your filter. When using the new platform, it is essential that you check the filters you have before drawing conclusions from your data. There may be an incorrect filter applied that is skewing your analysis. The keyword planner is nowhere near as robust as it used to be. When trying to create new campaigns, the keyword planner tool was very helpful in the brainstorming process. With the update, this tool seems less reliable for a couple of reasons: 1) Search volume for the same keyword is portrayed to be much less in the new interface versus the old. Search volume is important because it helps us to determine if the keyword is practical to bid on and if it will get enough traffic to drive results. 2) The “find keywords” portion of the keyword planner isn’t as targeted as it used to be. Now, keywords show that barely relate to the core term, instead of populating highly relatable and useful keyword opportunities. This now takes more time to manually sift through to get decent keywords. While the new interface is more visually appealing (and looks more similar to the Google Analytics experience than it used to), it takes more time to perform the same tasks due to extra steps that were not necessary in the old interface. The new platform was designed with the intention of creating a high-quality user experience and fast load times which, in turn, would be more efficient. While I have not seen a major difference in load time one way or another, I have noticed how much longer tasks take due to the extra steps involved. I believe the overall switch to Ads has the potential to be very effective and promising, but at the current state of the interface, that potential has not yet been met. Like any new advancement, continuous optimizations based on user feedback are necessary to take a good product to a great product. If Google Ads can adapt and find a utilize the best of the old and the new interfaces, I believe it can be an incredible tool to aid in search engine marketing efforts for advertisers worldwide. If you were interested in learning more about optimizing your PPC program, please contact us by email at sales@synapsesem.com or by phone at 781-591-0752. Google has recently announced yet another impactful change to their ad format. In 2016, expanded text ads were unveiled, essentially revolutionizing the basic paid search ad. With these ads, advertisers were granted a second headline, along with a longer description line of 80 characters. Now, Google has come out again and revealed that the format of newly launched Responsive Search Ads will also be available to regular text ads. Users are now allowed to create an additional headline 3 and ads can contain 2 description lines. That’s right…get excited paid search advertisers. Let the ad copy testing games begin. This means that these new ads can contain up to 300 total characters which makes them double the size of an expanded text ad. Essentially ETAs on steroids. While these additional headlines and descriptions are optional, the extra features provide a great opportunity to gain a competitive advantage in the SERP. Not only will the ads be inherently larger than the original expanded text ads, but they also will likely drive stronger CTR and overall conversion rate due to the added messaging available. Back in 2016, when ETAs were first available, we saw significant incremental lifts in CTR for the new ads across various clients. Not only is CTR likely to improve, but the option for more content will help to improve quality score. With 2 description lines advertisers have a greater opportunity to enhance ad relevance by using relevant keywords and messaging. Consider the findings below that document performance when the historical expanded text ads were launched back in 2016. The expanded text ads drove in a 11% higher CTR than the original ads. More importantly, overall volume grew by 37% which is expected due to the incremental lift in quality score. The enhanced quality score also helped to reduced CPC by 10%. In the meantime, users can test out the messaging on their own using the additional headlines and descriptions available within the expanded text ads. To learn how Synapse SEM can help improve your ad coppy optimization, complete our contact form or call us at 781-591-0752. “As with any update, some sites may note drops or gains. There’s nothing wrong with pages that may now perform less well. Instead, it’s that changes to our systems are benefiting pages that were previously under-rewarded. Did your website experience a change in organic rankings or traffic over the last couple weeks? Let us know! Google is quite the beast. It’s updating every day, several times a day, in efforts to serve users quality and relevant search results. In fact, experts say that Google changes its search algorithm between 500 and 600 times a year – aimed at fostering a better world wide web. Most of the time, Google’s algorithm updates are minor – they update a bug, weed out spam, penalize aggressive ads. Occasionally, however, Google will roll out a major (or, at the least, noticeably impactful) algorithm update. Sometimes these updates are so big they get big beastly names like “Penguin,” “Panda,” and “Hummingbird.” Other times, they go unnamed and under the radar, despite having a notable effect on search. This was the case – at least five separate times – in 2017. If you noticed a considerable dip in rankings or a significant spike in traffic last year, there’s a very good chance that Google played a part. Keep reading to see the Google algorithm updates of 2017! Just a month after the unnamed updates occurred, there was chatter among the SEO community that another Google algorithm update rolled out. Gary Illyes, Google’s own webmaster trends analyst, jokingly nicknamed the update “Fred,” but refused to share any specifics. The only insight Google gave us into the Fred update was that it affected sites violating Google’s Webmaster Quality Guidelines. Studies, however, showed that Fred mostly concerned websites with ad-heavy, low-value content that was produced only to generate ad or affiliate revenue. We’ve long known that Google prefers secure, HTTPS websites. Google uses SSL certificates as a ranking signal, meaning that secure/HTTPS sites have an advantage in the organic search results. In mid-April 2017, MOZ found that half of Google’s page-one organic listings were secure/HTTPS. By the end of 2017, 75 percent of page-one results were secured with SSL. Thus comes October 2017’s update, one of Google’s many efforts to move towards a more secure web. In part with the launch of Chrome 62, Google began warning users of non-secure pages and forms, showing an aggressive “NOT SECURE” notification when Chrome users enter text into a form-field on an HTTP page. My personal favorite Google algorithm update of 2017 happened late-November, when I could finally kiss goodbye that inhibiting 160-character-limit. Meta descriptions – those snippets of text you see under each link on the organic SERP – can now be up to 300 characters. The average snippet is now about 230 characters, and exact length restrictions have yet to be confirmed. It may seem like a small update, but this lift in character-length will mean more real estate for brands on Google’s SERP. Businesses now have more space to describe their pages/products/services and convince prospective customers to click. This could mean greater CTRs and SEO traffic to your website. In December 2017, around the holiday season, the SEO world was shaken by another Google algorithm update – or as Google would say, a series of “many and minor” updates to its algorithm. Unofficially called “Maccabees,” these were quality updates – Google knocked out more “doorway pages” from the SERP and penalized sites with few pages/thin content. Doorway pages are low-quality webpages created with the sole intent of ranking for a given keyword. Typically, they lead users to in-between, irrelevant pages that aren’t as useful as the desired destination – acting as a “door” between users and content. Mobile is not new to search engine optimization – Google has been moving towards a mobile-first index for over a year. Rest assured, however, that mobile will become an even bigger focus in 2018. Last month, Google officially announced that a new ranking factor will be coming forth this July. They are calling it the “Speed Update,” designed to demote the organic rankings of extremely slow mobile pages. If you have a responsive site that serves content quickly, you should be in good shape. However, we recommend running Google’s (newly updated) PageSpeed Insights tool to check your website’s mobile load times and mobile friendliness, to avoid any potential rankings loss. Without a doubt, 2017 was a year of content quality. In addition to the five Google algorithm updates listed above, there seemed to be near-monthly algorithmic, yet unnamed and unconfirmed, updates happening last year. We saw it in early February, mid-May, and again in August – high-quality, content-equipped websites gained SEO visibility, and websites with deceptive advertising, low-quality content, thin category pages, and negative UX experiences fell off. For business and marketing executives, knowing Google algorithm updates as they occur can help explain changes in organic rankings and traffic – significant spikes, drastic dips, a slow and painful downward spiral onto page 6 – and help you take steps towards improving your SEO. To learn how Synapse SEM can help improve your search engine optimization, complete our contact form or call us at 781-591-0752. Back in October Google announced they were making some changes, and campaigns would now be eligible to spend up to twice their daily budget. Here we discuss the background on that change, feedback from around the industry, and how it has impacted Synapse clients. Beginning October 4, 2017, Google announced their AdWords budget update, which stated that campaigns would now be eligible to spend double your set budget. This was a good thing they argued, as some days internet traffic is stronger than others, and Google would proactively adjust for any fluctuations in traffic. Overdelivery – allowing up to 2 times the clicks per day that your budget allows- would result in fewer missed opportunities for leads. Initial reactions to Google’s update were not seemingly positive. This was a large jump from the previous 20% potential overspend for AdWords campaigns. Many felt that Google was making it more difficult for them to properly budget accounts, and had major concerns over various budgeting scenarios. More recently, Ginny Marvin posted a 2x budget change article on Search Engine Land which outlined some of the responses she heard from various industry contacts. The more positive responses seemed to stem from advertisers that were using additional 3rd party tools for bid strategies as well as more robust budget management tools. Negative feedback for the 2x budget AdWords update included advertisers that felt this update caused a need for more time spent on budget monitoring. Spend issues noted were particularly prominent with new campaigns, and any automated campaigns. Some even had their entire budget spent by google in the first few days of launching a new campaign, and exceptionally high CPCs in campaigns such as the Smart Google Display Network campaign. Additionally, advertisers had concerns in accounts where they saw strong performance on certain days, and proactively pushed or pulled back budgets to reflect those trends. Google might claim their formula would automatically adjust for that, but as SEM experts, should our M.O. really be to let an ad serving platform do the thinking? Seems like a conflict of interest. Similar to Ginny Marvin’s feedback from various advertisers, Synapse has seen mixed results with this Google update. Some accounts have been impacted very little, and for those accounts we’ve barely noticed any shift in spending or traffic with this 2x budget update. Other accounts have been much more difficult to manage in terms of budget, and it has required additional operational hours to continuously check pacing to ensure we aren’t in danger of overspend. Many small-to-mid-sized businesses have strict budget limitations on a monthly basis, shifts in geographical priority, incremental dollars applied during the month, and some have budget reduced mid-month. Some want to pace evenly throughout the course of the month, and some require uncapped campaigns early on, and then get capped later in the month. Add in accounts that have 100+ campaigns, and all of these factors make the Google 2x budget update more difficult to adjust for on a regular basis. In certain accounts, Synapse has seen exceptionally high spend early in the month. Google would say to this, leave the budgets as-is throughout the course of the month and we’ll charge you for average monthly spend and credit you anything above that. But Synapse typically tries to keep campaigns as uncapped as possible, to control spend at the CPC level. This ensures any impressions you’re losing are due to rank and not to budget. To keep these campaigns uncapped, Synapse often sets daily budgets higher than they should be, and make bid and other optimizations to bring spend down. Google would not be calculating based on CPC adjustments however, they’d be calculating a monthly budget based on what daily budgets we set. To adhere to monthly budget restrictions, Synapse will often start scaling back certain bids and certain campaigns towards the end of the month. With Google’s update, Synapse now often needs to be even more aggressive and proactive in scaling campaigns back towards the end of the month to ensure no overspend. It is no longer as simple as calculating how much budget is left, and dividing by the number of days left. It’s a guessing game as to how much Google will exceed its budget this time. While we used to adjust throughout the month and scale back very slowly, now campaigns are becoming abruptly capped, and our clients may be missing out on key leads as a result. There have been both positive and negative reactions to this Google update, but ultimately the consensus seems to be that this change has made advertiser budgeting and pacing much more difficult. While we understand Google says they will not charge for any overspend, we cannot rely on a calculation after the month is over to determine whether we overspent our clients’ budgets. We need to instead, proactively ensure there is no possibility of overspending. That, after all, is part of why our clients are trusting us to invest their dollars to begin with. The purpose of a cap is that it should not and can not be exceeded. If Google is willing to spend up to twice that cap, it seems to defeat its own purpose. It may benefit Google in the long run to look into an alternative budgeting solution that will work better for the industry as a whole. If you’d like to learn more about how Synapse SEM can help you improve your paid search strategy, please complete our contact form or call us at 781-591-0752. If you are like us, then you can appreciate how useful AdWords can be to determine the right message to distribute to your customers. Ad copy testing is an important component of optimizing your campaigns and should be done regularly. The question is, what is the best way to do it? In this article, we’ll be going through our preferred method as well as an additional method recommended by Google. We will spend time speaking to the pros and cons for each but plan to put this test into action and write a follow-up article on results for next quarter. The most important thing for us, when it comes to ad copy testing, is to ensure each ad tested has received an even share of impressions. This is done by setting your AdWords campaign to ‘rotate indefinitely.’ This gives each ad the same amount of opportunity to entice the user to visit your site and convert. The issue with this method is that sometimes one ad can throw off the impression split if its relevancy is much higher than the rest. This happens when a group of queries matches up better with one ad variant, then it does with another. If you refer to the table below, you can find an example of an ad test with uneven impression distribution. If you were to make your decision purely based on CTR and Conversion Rate, you might think that Test 3 is the best ad. However, if you look at the impression difference between Test 1 and Test 3, you’ll see that Test 1 received almost 5x more impressions! This happens typically when one ad has a much stronger Quality Score relationship with the keyword than the others. Some would argue that the most relevant ad, independent of ad-level metrics, should be the winner here. We would likely relaunch this test once more to determine if the results were merely a fluke. One other method worth considering is using AdWords’ optimize for conversions setting. With this option, you can leverage Google’s algorithm that will automatically serve the ad that’s been deemed most relevant in most of the auctions. The benefit to this is that this setting will optimize your ads for clicks in each individual auction using signals like keyword, search term, device, location and more. The downside to moving forward with this method as your primary ad testing setting is that you are trusting that Google’s algorithm will provide you the best results. You won’t be able to distribute an even share of impressions. This isn’t all bad since the goal is to achieve the strong results for the ad group. For our next article, we’ll be putting this method to the test. The idea will be to determine if the optimize for conversions method yields more favorable results than our standard method. If you were interested in learning more about you should rethink PPC ad copy testing, please contact us by email at sales@synapsesem.com or by phone at 781-591-0752. In PPC, RLSA campaigns can sometimes be overlooked. Companies often latch on to the idea of flashy image ads to advertise their offerings, but little attention goes to how powerful remarketing can be for a search campaign. It truly surprises me how many businesses fail to recognize RLSA as a valuable paid search strategy. The given benefit of RLSA is that you are targeting users who have historically been to your site. Right off the bat, you know they are interested, and more likely to convert. Simply enabling RLSA and mirroring a current campaign structure can help to improve conversion rate. What many PPC experts do not know is how several simple strategies can boost conversion rate even more. Below explains 4 proven methods of creating a fully optimized RLSA campaign. Although it seems simple, excluding an audience compiled of users who have spent, for example, 5 less than 60 seconds on your site can be extremely impactful when it comes to increasing conversion rate. The ultimate goal of effective paid search is to target quality traffic, so why not weed out the bad when it comes to your RLSA campaigns? In order to determine the proper session duration, we recommend analyzing custom segments within Google Analytics to determine what drives the lowest conversion rate. Before implementing any sort of new exclusion we recommend confirming results with a test. You can use the AdWords Drafts and Experiments feature to replicate an existing high-volume campaign as a draft. A specific audience, targeting returning users with < 60 seconds on the site, was excluded from the draft campaign. It is important to choose a high-volume campaign so that results can be generated and deemed statistically significant as soon as possible. Check out the results of the test after a couple of weeks running. As suspected, the campaign with the exclusion was lower volume, but produced much more qualified traffic. Conversion rate improved by 20%. If your site produces a decent amount of traffic, a strategy targeting cart or checkout abandoners can be key to improving conversion rate. According to the Baymard Institute, roughly 70% of users abandon a site after reaching the checkout point. Applying an audience of users who have reached the final checkout page, but have not converted, to an RLSA campaign can yield positive results. Since this audience is highly invested in your product, you can increase bids drastically to target this user. Consider the campaigns created below. It is clear the volume is much lower than a regular search campaign, but the conversion rate and CPA improvements are extremely beneficial. Conversion Rate increased by 60%, while CPA is 38% lower than the search campaign. CPC increased because we are naturally much more aggressive with our bids in the Cart Abandoner campaign. Not only does excluding cart abandoners improve conversion rate compared to regular search campaigns, but it also can help to improve overall account performance. You have an existing search campaign and you want to apply an RLSA audience to the campaign. If you choose “Observation,” the campaign will function as a regular search campaign, and the bids will be adjusted, based on your audience bid modifier. So, if a returning user searches for a keyword, the bid will be increased based on the modifier. If a new user searches a keyword, the regular Max CPC will be applied. Choosing this option will not cause the campaign to only target returning users. You have a new campaign where you would like to solely target returning users. For this method, you would apply the RLSA audience to the campaign and make sure the setting is set “Targeting.” This method is useful when creating custom copy or testing out overly generic keywords. Also, this method will inherently be much lower volume than the “Observations” setting. Both settings can be key in helping boost conversion rate. It is just critical to know the differences between the two. DSA (Dynamic Search Ads) use the content on your site to target individual users. For example, if your site advertised bracelets and somebody search “gold charm bracelets” the DSA campaign would display an ad, with a dynamically created headline, and send the user to the page that Google determines the most relevant. This time saving strategy is a great way to expand your reach. Since you are not bidding on a specific set of keywords, DSA is perfect for keyword expansion. A great way to combat the low volume nature of RLSA campaigns is to combine it with DSA campaigns. DSA is often criticized for being too risky, and it tends to generate high traffic. RLSA is a key paid search strategy that, when used properly, can heavily enhance overall campaign performance. Overlaying the strategies discussed above can help to create high focused campaigns designed to boost account conversion rate. To learn how Synapse SEM can help improve your RLSA marketing strategy, you may complete our contact form or call us at 781-591-0752. When most people think “content,” they think “creative.” I know I did. Coming from a creative writing background, I was a firm believer that the best content was driven by out-of-the-box thinking and a convincing storyline. I knew that to be the best, to stand out, organizations needed to consistently put out engaging, memorable, and good-quality blogs, eBooks, whitepapers, what-have-you. But an overarching strategy holding all that content together? And numbers and data being a driving force behind that content strategy? Years ago, I would have told you that wasn’t my expertise; writing was. I’ve always known that writing and marketing go hand in hand, but never did I realize the extent in which data – more specifically, user data – could inform the type of content that business’ develop. And even more, how that data-driven content, combined with writing quality, could impact a company’s bottom line. To put it into perspective, consider one of our B2C clients. For two-and-a-half years, Synapse has been working with them to develop an SEO-optimized, data-driven content marketing strategy – and over that 30-or-so months, we have seen their online visibility skyrocket: First-page organic Google rankings for their blog have increased more than 15x since our content marketing scope began. Organic traffic to their website has increased 470 percent. And that’s primarily because of content – informed, intended, impactful content. Every piece of content created for your organization should have a purpose. It should have intent. It should be relevant – not only to your product or services, but also to what your customers are looking to read: What are they actively searching for? How often are they searching for it? How are they engaging with your website today? What is working with your current online strategy, and what is not? These are all questions you should ask before building out a content development and content marketing plan. By understanding your customers’ interests and needs, and creating content around that information, you can seamlessly integrate your brand with your audience’s online experiences – their newsfeeds, their organic searches, their overall online journey – and become relevant without disrupting their paths. The question is, how do you do it? Data. To me, one of the most intriguing facets of marketing is consumer intent, and the fact that digital marketers can actually discover, decipher, and track that intent through the use of online data. Fact is, consumers leave a data trail behind each time they take an online journey. This data trail consists of how they found your site, their exact search queries, digital interactions, social media activity, online purchasing history, time on your website, and more. Combined with SEO data like keyword volume and rankings, an organization can use this information to build a data-driven content marketing strategy with their target market in mind – a content strategy that will not only reach their target audience, but also appeal to that audience’s demand. Despite the benefits of a data-driven content marketing strategy, research shows that 38 percent of content marketers rarely use data to guide their initiatives. And, according to a study by Forrester, companies typically analyze only 12 percent of the data they have available. Part of the problem circles back to the art vs. science conversation around content – many organizations have creators to produce content, but lack a team of analysts to interpret and communicate data in a meaningful way, so that it can be used to inform a content development strategy. Another common issue is that the creation of data-driven content just gets overlooked. Marketing teams are busy – already juggling the brainstorming, the production, and the outreach that comes alongside content marketing. Thus, the inherent connection between data and editorial planning gets lost. Sometimes, businesses both big and small just don’t know where to start in terms of making that connection. That may be what has brought you here. First and foremost, you can look at your existing content. Which pages on your website drive the most organic traffic? Which pages or blog posts drive the most engagement, whether through back links, comments, or on social media? How much time do users typically spend on a given blog post? If you’re running on Paid Search, take a look at which keywords in your account drive the most activity – the most impressions can indicate more volume, the most clicks can indicate more relevance, the most conversions can indicate which themes actually resonate with your audience most. Use those top-performing keywords to drive your future, organic content. If you use tools like Google AdWords or Search Console, you can also look at search queries – the exact phrases people are searching for and using to arrive at your website. A Search Query Report (SQR) can reveal how consumers thinking, what they are looking for, and where the demand is in terms of keyword phrases. Popular themes in your SQR can then guide content that parallels user intent. Organic rankings can also provide actionable insights when it comes to content planning. Marketing tools like MOZ or Aherfs will show you where you are successful in your current content strategy (which keywords you have covered), and where you need to close the gap. For example, if you are ranking at the top of page 2 in Google for a given keyword, you can really push that to page 1 with the addition of relevant content. You can also use SEO rankings data to see where you stand against competitors. It’s important to not underscore the value of competitor content – their websites, their blogs, their resource library, are all right at your fingertips. Take a look at what type of content competitors are developing, how often they are churning it out, what types of themes they are going after, as well as their content’s presence in the organic SERP. Are there certain topics that are not currently covered on your website? Are there certain keywords you can outrank them on in the search results? Competitor content can provide insight into spaces you have not yet explored, as well as popular areas in which you can compete – yet only 47 percent of B2B marketers today use this data to guide their content marketing plans. These are just some of the many sources you can use to inform a data-driven content marketing strategy. Further website analysis, keyword research, customer feedback, and A/B testing can also prove beneficial in building a content plan. No matter what sources you use, it is important to remember that data and content marketing go hand-in-hand. And to be successful in today’s marketing arena, content must have a strategy to support it. A data-driven content marketing plan, according to the Content Marketing Institute, helps “to attract and retain a clearly defined audience – and, ultimately, to drive profitable customer action.” Content is the future of marketing, and it is data that tells the story behind it. It’s time we start listening. To learn how Synapse SEM can help improve your content marketing strategy, you may complete our contact form or call us at 781-591-0752. PPC can be a truly remarkable sales channel. Nowhere else are you able to target hand-raisers with such precision. With paid search, someone actually tells you I want “this” and as marketers, it’s our job to provide them with information to help meet their need. If your company’s primary marketing objective is to drive leads for your sales team, you might often run into the issue of “quality” when it comes to your PPC leads. While quantity is important, the qualified leads are the ones that end up generating real profit. In this blog, we will discuss the 3 fundamental keys to improving your PPC lead quality. Campaign structure: The account structure should be carefully planned with your business goals in mind. 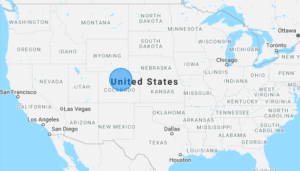 Consider which geographies are most important to target, how much budget should go to certain product lines, and what type of reporting you’ll need. Proper planning will allow for precise budgeting and simpler optimizations which will lead to more profitable results. Keyword targeting: When it comes to keyword targeting, you want to ensure that you have strong coverage over a wide range of keywords relevant to your business. After you finish identifying your initial keyword list, select the ones that you believe will drive the most qualified traffic and deliver the top leads. These terms will likely be longer-tailed iterations with less traffic volume. If enough historical data is present (sometimes your best guess must do), we highly recommend focusing on best-performing geographies and keywords. This high priority campaign will then receive a bulk of the budget, to ensure that your top performing keywords will receive maximum impression share. Once you have your keyword set finalized, it’s time to move onto the ad copy. Leveraging the appropriate messaging can be crucial in further qualifying traffic before you even incur the cost of a click. Often our clients will bid on expensive keywords that are applicable to both larger enterprises and smaller ones. This is inevitable because many organizations have similar product types but different target markets. This is where strategic messaging comes into play. As you can see, while our No Qualifier ad drove more front-end leads, it was our Qualifier ad that drove 150% more qualified leads. The cost per qualified lead is also much lower, almost 77% lower than the No Qualifier ad. We sacrifice performance from metrics like CTR and conversion rate, but we make up for it in the volume of qualified leads we generated with our Qualifier ads. Lastly, and arguably most importantly, you will need to ensure that your back-end tracking is linked back to your PPC campaigns properly. By using hidden fields within your forms, you can pass valuable PPC specific information from a landing page URL to your marketing automation or CRM system. This is very important for PPC advertisers because it will allow us to better understand which of our ad groups and/or ad messaging are driving the most qualified leads. We recommend including parameters like campaign name, ad group name, offer type, and messaging for starters. This way, when you run a Qualifier vs. No Qualifier ad copy test, you’ll be able to tell which ads are generating the qualified leads. 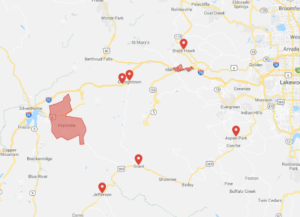 This level of tracking also can help you cut costs on areas of the account that never drive qualified leads and will allow you to reallocate to more profitable areas. If you were interested in learning more about improving your PPC lead quality, please contact us by email at sales@synapsesem.com or by phone at 781-591-0752. Search engine optimization (SEO) is a critical asset to any inbound marketing strategy. A sound approach to SEO will land you strong rankings, relevant search traffic, as well as leads and sales. According to industry experts, 70 percent of users today choose to click on the organic listings in Google’s SERP. And with nearly a 15% close rate, SEO leads are some of the most valuable to marketers and businesses today. Weeks ago, you may have thought you had this SEO thing down pat—your marketing team has been churning out content nonstop, building hundreds of links to help boost your site’s credibility, maybe even going after high-volume keywords on your website in efforts to get traffic. The problem is, you’re not seeing the results. Your efforts aren’t adding up; your rankings aren’t moving up; your position might even be falling in Google’s search results. Technically, you’re not where you need to be. Perhaps one of the biggest strategic SEO mistakes you can make on your website is putting too much weight on your organic rankings. While important, good rankings will come later down your story line. SEO is a process, and in order to be successful at it, you must start from the ground up. You must first ensure that your website has a solid technical SEO foundation in order to achieve organic visibility. I’ve already talked about the SEO mistakes that hurt content marketing. Today, I walk you through the seven technical SEO mistakes we’ve seen sink search engine rankings and bring down entire websites in Google. 1. Your website is slow, period. Of all the technical elements that go into a website’s success, the one that remains a top consideration in Google’s ranking algorithm is page speed. Fact of the matter is, users want answers to their searches fast, and search engines therefore want the web to be the fastest it can be possibly be. As an effort towards meeting user demands, search engines like Google and Bing rank the fast loading websites higher than equivalent, slower websites. Your organic performance is going nowhere fast if you think that page load times do not have a direct connection to SEO. For one, a faster website is typically ranked higher in the search engine results. This higher ranking will bring in more traffic to your website, in turn generating more pageviews and converting more leads. Not only this, but page speed has a direct impact on user experience as well. If your website is operating slowly, your bounce and exit rates are likely to increase. To put it into perspective, users typically do not want to wait more than five seconds for a page to fully load. Page speed mistakes we’ve commonly seen are: over-sized and high-resolution images that take excessive time to load, failure to use compression and browser caching on slow-loading resources, and poorly structured HTML or CSS code. To analyze your website’s load times and to see exactly where it may be tripping up or falling short, you can use Google’s DIY PageSpeed Insights Tool. 2. Your site isn’t mobile friendly. And, as mentioned in my previous article, Google gives mobile-friendly websites a rankings advantage by adding “Mobile-friendly” labels to their listings in the SERP. For businesses trying to boost their SEO strategy, optimizing your website for mobile search will be a critical factor in your multi-channel ranking success. 3. You’re telling Google to ignore you. That’s right. All the time, websites unknowingly tell Google to ignore and not rank their pages organically. This is one of the most detrimental SEO mistakes of all, and inadvertently can happen right in your site’s own source code or Robots.txt file. 4. You have cookie-cutter or duplicate content. Content is king in the realm of SEO, and one of the most common mistakes we’ve seen affect organic rankings is the creation of unoriginal or duplicate content. To put it simply, Google ranks pages that offer value to readers; content that is insightful, educational, or has merit – Google does not want to rank content that looks like everything else on the web. When ramping up keyword optimizations on your website, it can be tempting to replicate or recycle content that targets similar keyword themes. Our advice? Don’t. Write unique content that engages your readers and that encourages them to spend time on your site. This will tell Google that you are credible and rank-worthy. If you use quotes from other sources, link to them. 5. You’re forgetting about on-page SEO. Perhaps one of the greatest SEO mistakes you can make on your website is forgetting to implement or customize its on-page elements: title tags, meta descriptions, alt tags, even header tags are often lost amidst website builds. But skipping out on these meta tags is a major missed opportunity for SEO, and can deter Google from ranking you on the key terms your target markets are searching. 6. You’re stuffing keywords onto the page. Keyword-stuffing is not only a black-hat SEO practice, it is also an outdated method that can actually get you reprimanded by search engines and lose you site traffic. See, Google’s top priority is providing a good user experience, and users do not want to read an article that is stuffed with keywords and lacking any takeaway value. Not to mention, they won’t link to keyword-stuffed content. You won’t look credible and you won’t rank well. 7. Your webpages are not authoritative. We often hear, “I just created a keyword-optimized webpage for SEO. Why isn’t it ranking?” or, “Why are competitors ranking above me in Google?” If you are here, you may be experiencing similar concerns. Let me tell you this: if you have implemented an optimal keyword strategy on your website and are still falling behind rankings-wise, it is likely because your domain or page authority is low and not up to par with the other players. This is especially true for new webpages or domains that start out with an authority of 1 (on MOZ’s scale of 1 to 100) and need to gain credibility in Google’s eyes. The best way to build up authority is through natural and quality links. Google will penalize you for generating unnatural, paid, spammy, or engineered links. Do not make the common SEO mistake of paying people to link to your site; do not use black-hat link-building tools like ScrapeBox to spawn backlinks in mass quantities from sketchy sources. This will not only get you demoted in the search results, but also blacklisted if Google finds out. Earn your links through quality, credible, and linkable content and you will be rewarded with improved rankings. When it comes to SEO, there are no shortcuts. Whether you are a business owner, marketing director, or CMO, whether you are an enterprise, small business, or non-profit, it is important that you approach search engine optimization the right way in efforts to gain Google’s good graces for the long haul. Your first steps will be correcting these ever-so-common SEO mistakes. To learn how Synapse SEM can help improve your SEO strategy, you may complete our contact form or call us at 781-591-0752. Whether you are a paid search marketer or not, we have all experienced those image ads following us around on almost every site we visit. Remarketing is a feature that allows advertisers to reach individuals who have previously visited their site when they are searching on other sites. Fans of remarketing boast about the ability to easily establish branding and influence customers who are likely to be interested in your product (since they’ve visited your site previously). Critics complain that the “Big Brother” aspect can be creepy and irritating to users. That fact is, remarketing and audience creation are powerful tools for paid search. When implemented correctly they can increase conversion volume and provide countless opportunities to cross-sell your target audience. A successful remarketing campaign starts with an audience. Here are 4 remarketing audiences that every search engine marketer should be using. A crucial point of remarketing is to attract previous site visitors to return to your site and make a purchase. Many marketers follow through with this strategy by simply targeting all users to their domain. However, they leave out one significant element. Advertisers are constantly wasting their impressions and sometimes even clicks on individuals who have already converted on their site. 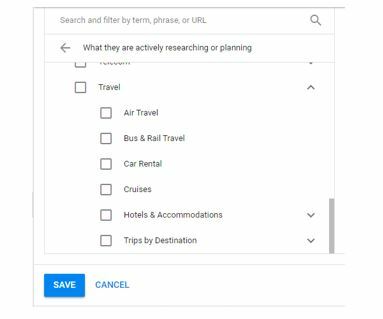 A great way to narrow down your remarketing efforts and strengthen your target audience is to exclude anyone who has visited a confirmation page or a specific checkout page. This will also help to improve click-through-rate because obviously, someone who has already downloaded or purchased a product is less likely to click on that same advertisement. Another key strategy is to specifically target users who have reached a checkout page or a cart, and left the site without converting. These individuals are typically more interested in your product, and you can capitalize on this by increasing bids. All of these strategies can be put in place when creating an audience. Google Analytics gives you the option to exclude users who have completed a goal, and you can also exclude anyone who has visited a specific page (i.e. a confirmation page). Many B2B companies attract low funnel leads through content downloads (i.e. (white papers, infographics, eBooks, etc.). 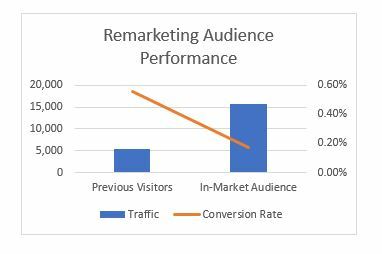 A great remarketing audience strategy is to create a separate audience list for users who have downloaded a specific piece of content. Then, you can specifically target those users with deeper funnel CTAs (i.e. free trials and demo requests). This notion can be seen in the results of one of our B2B clients. We set up a nurturing campaign in order to cross market to our previous converting users. Consider the conversion rate discrepancy between the regular Non-Branded Search campaign below and the special Content Nurturing campaign. Although volume is lower than the search campaigns, conversion rate is 164% higher. This is an excellent practice for B2B companies who have specialty lead nurturing marketing programs. For smaller companies attempting to use Remarketing to acquire new customers it can often be a challenge to create an audience that is large enough to become eligible for the Display Network. For example, a remarketing audience list must contain 100 active visitors or users within 30 days. If you are utilizing very specific and niche targeting, this can sometimes be a challenge. Google remedies this with the introduction of Similar Audiences. These audiences are created by Google and take into account the actions users take within your original audience. Google assigns any user that has similar search history as your site converters into a Similar Audience. For example, if your audience is targeting users who have reached a page about bedroom comforters, instead of targeting users looking for the broad category of “bedroom furniture,” it will remarket to people looking specifically for comforters on Google.. For more information on RLSA campaigns and Similar Audiences read our latest blog post. One uncommon aspect of Remarketing audiences is the ability to use them for search campaigns. This is often practiced in RLSA campaigns, but there is one strategy that can be used for almost all search campaigns. Most sites have a Login Page or a Careers Page. Most likely, organizations are not interested in targeting individuals who have visited those pages. A great strategy to implement is to create a search audience targeting visitors to those two pages if applicable. You can then exclude that audience within your search campaign. Doing so will help limit impressions to only relevant customers. This is a technique that can be beneficial for both brand and non-branded campaigns. If you’d like to learn more about how Synapse SEM can help you improve your paid search or organic strategy, please email us at sales@synapsesem.com or call us at 781-591-0752. One of the more recent updates within Google AdWords is automated call extensions for landing pages that prominently feature phone numbers. This update was announced in early January, and just rolled out last month. As many advertisers were notified, the update by Google is intended to make it easier for users to make calls to businesses through their mobile phones, and will allow for more detailed reporting insights on call performance. Google stated that this year, mobile search engines are expected to drive around 33 billion click-to calls to businesses globally (19% more calls than from mobile landing pages alone). As Synapse has learned with many of our B2B clients, more and more lead-gen companies are relying on marrying call data with online form data to determine their total number of prospective opportunities. This update by Google will make it even easier for advertisers to properly set up click-to-call moving forward. First and foremost, if you do not already have call extensions set up within your account, Google will begin automatically creating call extensions based on prominent phone numbers listed on your landing page. Previously, you would create call extensions manually through the call extensions tab. You could set up your business phone number, or a dynamic phone number and have Google automatically generate numbers and forward to your business. Have phone numbers that are dynamically generated? Not to worry. Google will only automatically pull in phone numbers that are not dynamic in nature. If you’re already running call extensions, Google will leave everything as-is. If for any reason you do not wish to have click-to-call set up within your account, make sure to go to your call extensions tab and remove any that Google may have already created for you (the update was activated on February 6th). What else may be impacted? Along with the automated call extensions, which limits time manually updating ad extensions and minimizes room for error, Google also noted that there would be more robust reporting. Not only will you see the number of calls per day as you used to, but also call duration as well as start and end times. Additionally, Google will provide the caller area code for each phone call, and whether the call connected. Advertisers can also set up call conversion tracking to see which campaigns are driving the most valuable calls. What other options are there outside of automated call extensions? Some third-party solutions such as DialogTech and CallRail could be an alternative solution to ensure you’re tracking client leads all the way through to opportunities and sales. While automated call extensions offer more robust insights than the original call extensions, third party solutions may be a great alternative to ensure you’re able to track all the way through the funnel. One caveat to these solutions is that you’ll need to be sure you have sufficient volume – without a certain number of clicks in each ad group, some of these solutions won’t work properly. While there are mixed reviews out there right now on Google’s latest automated call extension update, one thing is for certain: Google’s push for updates specific to mobile-advertising is only getting more aggressive as the months progress. We fully expect to see additional mobile-focused updates come out from Google in the upcoming months, hopefully allowing for more robust insights in terms of tracking all the way through the funnel. Sluggish site load times are a core finding on over 50% of the Technical SEO audits we perform for our clients. When we present our clients the data and show them Google’s Page Speed Insights, we’re often asked, “Is it worth investing to improve these load times?”. Improving site load times is an easy task to push off. Optimized load times are not prerequisites to running search engine marketing programs. If you want to spend money on search with a slow site, Google or Bing will happily take your money. On the SEO front, content development initiatives often take priority over the technical work required to fix poor load times. But as the competition has literally ‘quickened,’ the ramifications of a slow site have become more and more pronounced. The User Engagement and Revenue Impact – Slow load times are a major driver behind user bounces and exits. “58% of shoppers will leave a website if it takes more than 3 seconds to load.” For Amazon, for example, “a 100 millisecond improvement in load time [is equivalent to] a 1% revenue increase.” These stats demonstrate a clear connection between page speed and conversions and ultimately ROI. From conversion rate, to SEO rankings, to SEM ROI, site load times are having a major impact on the performance of your digital marketing programs. Have you pushed off improving site speed? If so, it’s time to get into action and make site speed a priority and a core KPI in your digital strategy. To learn more about improving your site’s load times and implementing a technically sound SEO strategy, please contact us today! https://www.synapsesem.com/wp-content/uploads/2017/03/Page-Load-Time.png 416 739 synapse https://www.synapsesem.com/wp-content/uploads/2013/04/Synapse_SEM1.png synapse2017-03-17 18:07:402017-03-17 18:07:40Are Slow Site Load Times Crippling Your Digital Marketing Programs? One of the most common questions that arises in the world of digital marketing is, ‘how do I most effectively allocate my digital marketing budget?’ This question comes up frequently amongst our clients, and unfortunately there is no cut and dry response. The answer to this question depends upon many factors, but for the purpose of this article (as well as our readers’ sanity) we’ll narrow our thoughts down to 4 important factors to consider when determining how heavily to invest in paid search and SEO. 1) Are you an established site with reasonable domain authority, or are you a completely new business? If you are a business with a completely new site, chances are there isn’t a ton of awareness out there about your brand. You also likely don’t have much SEO credibility, which means you’re probably not showing prominently in Google for your key terms. To start generating leads or sales, the best bet is to begin advertising through paid search, where you can pay for immediate visibility for your most important keywords. Because SEO improvements take much longer to take effect, paid search is your best option. If you are a firm that is already established, with strong rankings (which would mean you’re ranking on page 1-2 on critical keywords), a more even investment could be made across paid search and SEO. This will allow you to capture leads quickly through PPC, but also continue expanding upon the organic keyword set you’re currently ranking on. 2) What does your timeline look like? The next most logical question to consider is your timeline. How quickly do you need to gain these leads or sales? Do you have an upcoming deadline and are you behind on your goals for lead volume? If you have set goals to hit a certain number of leads within the next 6-12 months, invest in paid search. Ranking organically can take 6-12 months or longer, and by then you’ll just be starting to rank (and definitely won’t be hitting your goals). If you have more time to spare and are more concerned with longer term lead generation, investing in organic is a safe bet to ensure you build domain authority to get your site to rank. If you have short-term AND long-term goals you must meet, then investing in both channels is critical. 3) Are you profit or revenue focused? Is your business more focused on profitability or revenue growth? This is a tricky one, and timing, as well as how established your site is, definitely come into play here. SEO and PPC can work with either of these goals, however SEO is a better long-term solution to driving efficient profit (you’re not paying for organic clicks, after all). With PPC, you have more control over tracking and optimizing based on ROI, but it will be the more expensive option in the long run. If your site is already well-established organically, you may be able to grow your bottom line by investing more aggressively in paid search. For lead generation, paid search will be the better option if you want a certain number of leads and want them quickly. For longer-term lead-gen, you’ll want to invest more heavily in SEO, since that’s where most of the click traffic goes. Your KPIs are critical to consider, but timing and current positioning within organic results also play into this decision. 4) How niche is your business? While paid search is an extremely effective and profitable channel most the time, certain ‘niche’ businesses have markets that are so specific or narrow, they may not fare so well in the world of paid search. Businesses that require mainly long tail keywords will not generate a substantial amount of search volume. In many cases, shorter-tail terms aren’t specific enough for these businesses, and will lead to high costs for too many unqualified leads. In the case of a business with a niche market, SEO may be a better avenue for investment, to ensure you are gaining visibility on these same short-tail terms, without the high costs associated with unqualified traffic. If these happen to be terms that seem too broad, it’s not as much of a risk because you aren’t paying for the click with SEO. Relevancy is always important to consider, however it will pay off more in the long run to target broader terms that actually generate volume organically, than to run paid marketing for inefficient short-tail terms or low volume long-tail terms. Though these are just a handful of considerations for determining your search marketing budget allocation, we hope this helps you get started in thinking about the best avenue for your company to take. If you’d like to learn more about how Synapse SEM can help you improve your paid search or organic strategy, please complete our contact form or call us at 781-591-0752.
Business owners, CMOs, marketing VPs – step up to the plate. If your website is falling below page one in Google, or struggling to rank at all, you may feel like your digital marketing efforts are at a loss. You may be losing quality traffic and qualified leads or sales to your competitors. You may be lacking the online visibility you need to stay afloat. When rankings fall short, online visibility suffers—and vice versa. According to a recent Hubspot survey, the top-three positioned results on a search query receive over 60 percent of all search clicks. And on average, 75 percent of users do not scroll past the first page of organic search results. Google uses an ever-changing algorithm to rank the most relevant, credible websites first on their SERP. Today, there are well-over 200 “ranking signals” used to determine whether you will rank above your competitors in the search results. And these signals are constantly evolving. The question is, how can you keep up? Amongst a content-saturated web, how can your website stand out? Right now, you may feel like you are doing all that you can to get your website to the top of the SERP – stuffing your content with highly-searched keywords, assigning link-building exercises to your marketing team, churning out blogs on a weekly basis. Yet still, the return on your investments is minimal. If you feel like you’re losing the game of SEO, it may be time to step back and review the bigger picture. Consider what you are focusing on, but also what you may be missing. Evaluate your SEO strategy and ask yourself how it ties into your other marketing campaigns. Does it at all? SEO Mistake #1: There is no relationship between your content marketing and SEO strategies. Perhaps one of the greatest strategic mistakes you can make when it comes to search engine optimization is keeping SEO a standalone strategy. SEO is just one key component to search engine visibility – and it cannot be successfully executed without quality content and the foundation of a solid content marketing strategy in place. While very different entities, SEO and content marketing in fact go hand-in-hand. It is search engine optimization that will help your content reach target audiences, your content that will influence your readers, and your content marketing plan that will ensure those users either convert or come back. You cannot successfully have one without the other. Recent studies have shown that content marketing leaders experience nearly 8 times more unique website traffic than non-leaders today. To be a content marketing leader, you must do more than produce content. You must produce consistent, quality content that engages your target markets. You must marry this strategy with your SEO efforts in order to properly distribute your content to the right buyers, just as they are looking for it. SEO Mistake #2: You are not using data to plan your content. As a business leader, you want each piece of content on your website to both appeal to as well as engage potential buyers. That said, you must plan your content accordingly. Before scheduling your next whitepaper or blog posts with your content dev team, try looping your SEO and SEM team into the conversation. Together, work on planning content around the keyword phrases that will most benefit your target markets. Which phrases have converted in the past? Which keywords generate the most volume and the most interest? SEO Mistake #3: You are missing the competitive mark. When is the last time you checked in on how your competitors are ranking? Next time you find yourself in Google, take some time to do so. In an incognito window, manually search some of your highest priority and competitive keyword phrases. Are any competitors ranking above your website? If so, what are they doing that you are not? There are several SEO tools that can be leveraged to get competitive in the organic SERP. Ahrefs, for example, is a backlink checker and competitor research tool that will actually show you how many more inbound links you need to rank above your competitors for a particular keyword. Competitors’ SEO rankings can be used as a creative content and SEO advantage. On one hand, you can see how they are structuring their meta tags and webpage content, as well as what types of content they are creating: whitepapers, infographics, blog posts and more. Even more, you can use competitor websites to discover new keyword themes that may be lacking in your current content efforts. Talk to your SEO team about which tools can be used to “spy” on your competitors’ organic keyword sets. SEO Mistake #4: You are overlooking gaps in your content. Content gaps are ancillary keyword themes that are currently lacking on a given website. They can be identified by evaluating competitor websites, looking at your current organic rankings, and determining where you have the most ranking opportunity. Are you ranking on page 2 in Google for a high priority keyword theme? This may be because you do not have enough supplemental content to support it. Identifying this gap and building out keyword-centric content accordingly, can help you push organic rankings. All the while, it can serve as a great effort to produce fresh and relevant content for your audience. Doing a comprehensive content gap analysis will allow you to identify major ranking opportunities and returns for your website. If you are ranking at the top of page 2 in Google for the keyword ‘marketing software’, for example, you may consider creating a clear-cut content plan around that keyword theme. Any supplemental ‘marketing software’ themed content you publish, then, will help you gain more relevance on that keyword and boost your SEO rankings to page 1. SEO Mistake #5: You are relying too heavily on high-volume keywords. Another all too common SEO mistake is an overreliance on high volume keyword rankings. While extremely important for organic (and therefore, free) traffic, search volume is only one of many KPIs to think about when reviewing your SEO and content marketing strategies. If you are optimizing your webpages for only high-volume, competitive keywords, and getting frustrated with the lack of results, this especially pertains to you. We know—it can be easy to get caught up on high-traffic keywords when optimizing your website content, but keep in mind that a lot of traffic does not always mean quality traffic. High volume does not always mean more traffic, either. Let’s say you are trying to rank for a generic keyword phrase that has an average of 100,000 monthly searches. Remember that thousands of other websites may be trying to rank for this keyword phrase, too. If you do not have a high domain authority, you may get lost amidst bigger names and more distinguished brands. And if other authoritative web pages (say, Wikipedia or Capterra) are taking up page one for a given query in Google, your chances of ranking are little to none. So rather than going after the generic term, target keyword phrases where competition is comparable. Try to tailor your optimizations to very specific and relevant keyword themes, even if it means sacrificing some search volume. Often, it is these keywords that bring more quality traffic and will drive your online lead generation. In fact, you may actually see an increase in qualified traffic by implementing this strategy. SEO Mistake #6: You do not have a sound internal linking strategy in place. For one, internal links help users navigate your website. Through the use of internal links, you can direct users to priority pages on your site – such as an asset or a demo page – and lead them to conversion. If you create a great Buyer’s Guide eBook, for example, you can use blog posts and other related content to direct users to the download page. This internal linking approach not only users, but also contributes to your business and larger lead generation strategy – by directing relevant, qualified contacts directly to contact and download forms. Internal links also help search engines better crawl your domain. Failing to internal link to pages within your site architecture can make it nearly impossible for search engines to index your pages accordingly. To put it simply, if you do not have a single link pointing to your page, search engine crawlers will not be able to reach it nor rank it. One of the greatest benefits of internal links is that they help disperse link equity across your domain. Through internal links, you can build any given page’s authority and therefore its chances to rank in the organic SERP. Keyword-rich anchor text on those internal links further supports this approach. By using target keywords in your hyperlinked text, you can tell crawlers what a page is about and increase your chances to rank for a given query. When it comes to digital marketing, it is the little things that make all the difference— There are hundreds of ranking factors determining how your business will stand in Google; what feels like the slightest mistake could be all that it takes to weaken your rankings and push your competitors ahead. That said, it is very important that you are aware of – and equipped to address — these common SEO mistakes.